The Ballymurphy inquest has heard evidence about a prolonged gun battle involving British army paratroopers, IRA gunmen and loyalist gunmen. In court was former Distillery and Glentoran footballer Gerry McCaffrey. He lived with his family in Springfield Park at the time. 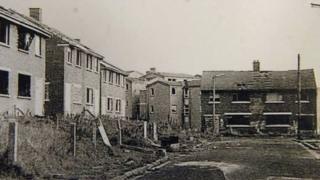 The inquest is currently looking into the deaths of 38-year-old Father Hugh Mullan and 19-year-old Francis Quinn, shot dead on waste ground beside Springfield Park on 9 August 1971. Ten people were shot over three days in August 1971, amid disturbances sparked by the introduction of internment without trial in Northern Ireland. Mr McCaffrey's wife Margaret was the niece of Joan Connolly, who was shot on the Springfield Road the same day. Mr McCaffrey told the court on Wednesday that a loyalist crowd from Springmartin had attacked their homes, and how after boarding up some windows, he and his family tried to flee towards the Moyard area. He said he had seen a youth in Springmartin stagger and fall at the same time as he heard a shotgun blast, probably from Springfield Park, but he did not see who had fired it. Later, as he carried one of his children, his upper back was peppered with a shotgun blast, but he was able to keep going. He said he saw two RUC men laughing and joking with the loyalist crowd attacking his street, and when he later reported this to the authorities, was told there had been no RUC men in the area that day. At one stage he said, paratroopers in Springmartin were exchanging fire with three gunmen he took to be members of the IRA, who had arrived in Springfield Park. He said each had a weapon. He told the court that the army fired into Springfield Park at these gunmen, and at another area in the field or waste ground where he thinks there must have been gunmen at one stage. He accepted he had not actually seen any gunmen in that second location. He also insisted that the soldiers did not fire at the loyalist gunmen in Springmartin who had already been shooting at his community. He admitted he had not told the RUC or an inquest in 1972 about the three IRA men because he would have been afraid to be asked to identify them. He thought two of the men were in their teens or twenties, and the third was middle-aged. However, he felt that their presence had probably stopped loyalists from completely overrunning Springfield Park that night. Once the army began firing Mr McCaffrey said the IRA men left the area, but the soldiers continued shooting. "I don't doubt that they were firing at gunmen," he said. "It's the ones who didn't have guns they were firing at as well." He is convinced that it was the army who had fired the shots which killed Fr Mullan and Mr Quinn. At one stage he said the soldiers fired "indiscriminately." He explained that he had seen Fr Mullan being shot. Mr McCaffrey described how he and others used a door removed from a garage to carry Joe Millen from the field where he was hit and wounded. Mr Millen survived and gave evidence to the inquest last Monday. Later that evening, Mr McCaffrey said, he saw high velocity gunfire with tracer bullets being fired from the Moyard area towards Springmartin. He said he had lived through the Troubles and this was the heaviest gunfire he had ever witnessed. He had wondered at the time if this was the IRA, but later concluded that it could have been the British Army because they had such heavy weapons. The army had soldiers based at Vere Foster school and also at the nearby Henry Taggart Memorial Hall. Mr McCaffrey also described the inquest into the death of Fr Hugh Mullan, which took place in October 1972. He told the court he could remember an RUC witness saying he had been behind a soldier who was in a kneeling position and who had shot Father Mullan. He said he remembered thinking that this evidence was markedly different from what the soldiers at that 1972 inquest had said, that none of them had noticed a priest. Meanwhile, the family of Francis Quinn has thanked another witness at the inquest for the respect he showed to their relative's body. 71-year-old Hugh McAloran told the court how he had helped carry the body of Francis Quinn to his own house in Moyard Parade and sat with it until an ambulance came to take it away the next morning. He told the court he had expected the army to come and intern him as a result, but this didn't happen. Often visibly upset whilst giving evidence, Mr McAloran said he had been angry at an army statement saying they had shot a gunman in some flats in Moyard. "I went mad, to tell you the truth," he said, "because I knew the wee lad had been shot in the field. We already had the body in my house. I knew it simply wasn't true." He described how the next day he took a television news crew to see a nearby flat which had been hit dozens of times by high velocity bullets overnight. Later Gerry McCaffrey's former neighbour, Jackie Burns, gave his account of the events of that day. He witnessed the shooting of both Mr McCaffrey and Fr Mullan. He explained that he sheltered on the waste ground with his eight-year-old daughter but could not leave because of the gunfire. A man came along and broke a streetlight so that they couldn't be seen, enabling them to escape.